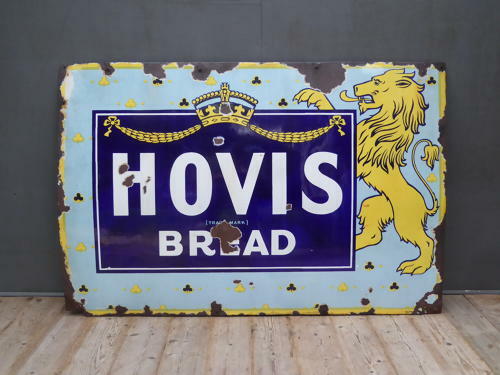 A large early vintage enamel advertising sign for Hovis Bread. An exceptionally rare sign in a very eye catching & regal design, manufactured by The Falkirk Iron Company & featuring some fantastic colours and a great gloss. A wonderful sign, perfect for a kitchen cafe or restaurant! Wear commensurate with age, unrestored. UK courier service available at £58 tracked & signed for 48 hour delivery (The sign is too large for a regular service so will be sent via Parcelforce 48 Large at cost).